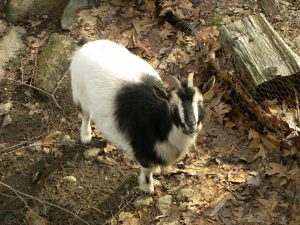 We have a small herd of Nigerian Dwarf dairy goats here at Living Land. We are permaculturists first, not “goat people.” No offense to goat people, that’s a great kind of person to be! But we are keeping goats because they match the needs of us and our land, not because we simply HAD to have goats. (I had actually hoped for a Jersey cow back when I was dreaming of pastureland!) 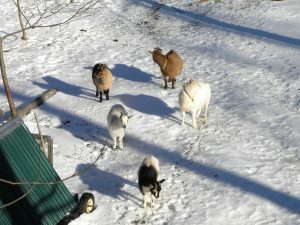 I also hope it helps explain to you why we use some practices that are unusual amongst goatkeepers. We are just coming from a different starting place. 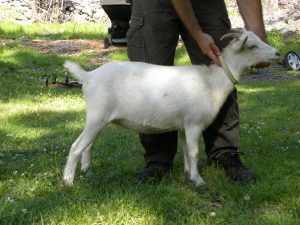 As advocates of natural-rearing, we don’t give medications to our goats unless they truly need them. That means we don’t routinely vaccinate or de-worm. 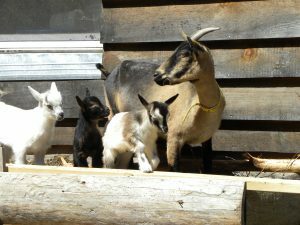 All our goats are “dam-raised” for at least 2 months (and for the ones that we keep, much longer!). We think this gives them a good foundation to stay healthy with minimal intervention from us. We also think it’s better for their temperament / psyche. We want our goats to know they are goats and learn from their moms and their herdmates how to behave. Joel Salatin says to ‘Let a pig be a pig, let a chicken be a chicken’ and we want to let our goats be goats. Our goats are very friendly even though we do not bottle-raise them. 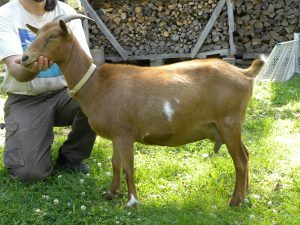 We don’t breed our goats until their second year. We understand this as an investment. Allowing them to be more developed before putting energy into their kids means a healthier, longer-lived animal. 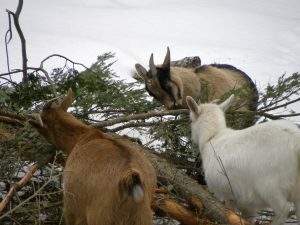 We feed them on forage, especially trees and brush, as much as possible. Of course they get supplemental hay offered all the time, but we try to keep them in woods more than on grass pasture and we give very, very little grain. We do have lower milk production because of this practice, we know. But we are critical of the current animal production system which feeds lots of grain to animals that aren’t well-suited to that diet, and we don’t like buying all that grain from afar. One reason we wanted to raise our own animals was to be more environmentally sustainable – then we find ourselves shipping in all these bagged products! Our hay is from neighbors down the street so we are comfortable with that. We aren’t grain free – ¼ cup of oats and ¼ cup of black oil sunflower seeds get the girls onto the milking stand and entertains them for a few minutes at least. And we have one doe who needs a little more at high milk production times or she gets too skinny. We respond when she needs it. We have another that would get fat if we upped her grain at all. 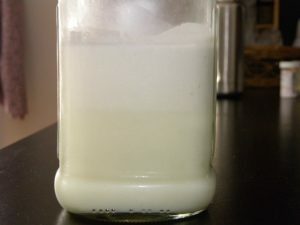 Although we give up milk quantity, the quality is wonderful… here’s a pic of some of our milk which we let sit for a few days to separate – see that cream line nearly half-way down?! 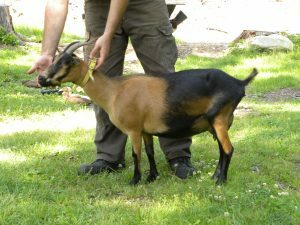 We do offer our goats a mineral mix and baking sodium, free choice, at all times. Our herd tests fine for selenium, so we haven’t given them extra supplements of that. We have recently seen some signs of copper deficiency in two of our goats, so are having them tested and will likely need to use a copasure bolus with them. We do monthly hoof-trimming as well. We have had almost no parasite problems. We watch their dropping consistency, and do have them tested now and then, and just haven’t had problems. Now and then we have seen clumpy poops and gave them Molly’s Herbals wormer, and all cleared up. 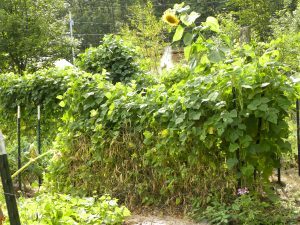 As natural-rearers, we don’t worm them on a schedule, but as needed. As for the big goat diseases – every year we test for CAE, CL and Johnes – all negative so far. We do not go to shows, only bring in bucks who have been tested, and have even begun to keep our own bucks to further minimize disease risk. We don’t disbud (we are willing to have it done if a kid is retained and that is wanted – we are NOT saying everyone should keep them horned). For our situation we just don’t see any need for disbudding. We have mentors who have horned goats, most fiber goats stay horned, and in many places of the world even dairy goats aren’t disbudded. The horns do serve a purpose for them, which is why they grow them. So far it has worked out fine for us. We think folks should know this is an option to consider, though we know that it is NOT appropriate in every situation. 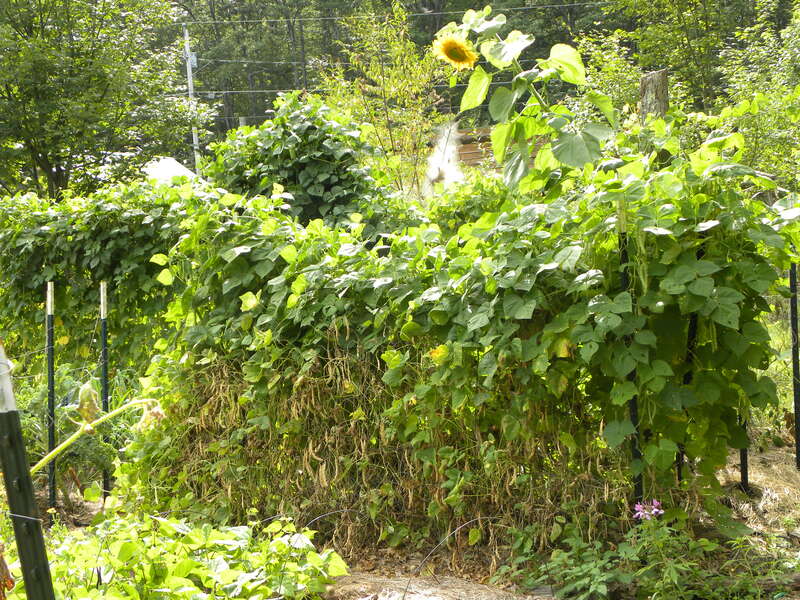 Our major influences / teachers on goatkeeping are: Juliette de Bairacli Levy, Susun Weed, and Deborah Niemann. 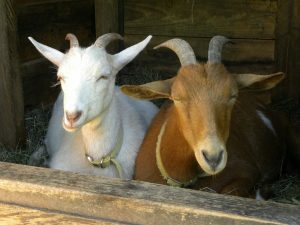 We want to give thanks to the goatkeepers who did the wonderful breeding that we are benefiting from now, especially: Tragos Trip Farm and Old Mountain Farm.